A Framework for Agricultural Adaptation to Climate Change in Southern Nigeria. Drivers and Sustainability of Agricultural Growth in Nigeria. Economic Deficits of Nigeria's Agricultural Sector: Underlying Factors and Agenda for Strategic Reforms. Has Autonomy of State Governments Bolstered Achievement of MDGs in Nigeria? Recovery of Kakamega tropical rainforest from anthropogenic disturbances. Centre, Central Business District, Abuja, on May 31st, 2018. 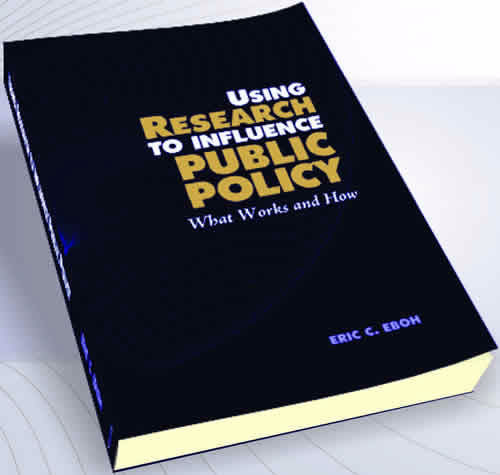 ‘‘Using Research to Influence Public Policy’’ is a blending of theoretical postulations and practical experiences to unravel what is often referred to as the “black-box” between policy research and policymaking. It elucidates what works and how. Those doing or wishing to do policy research are provided simple and proven principles, tools and procedures to make the most impact on public policy. Development practitioners, non-state actors and policymakers are shown best practices by which they can benefit most from policy research. Overall, this book is a significant practical advancement of the evolving tenet that policy research and policymaking are interlinked processes for making public policy achieve its development objectives.